Another Road Trip to Paxton, FL? 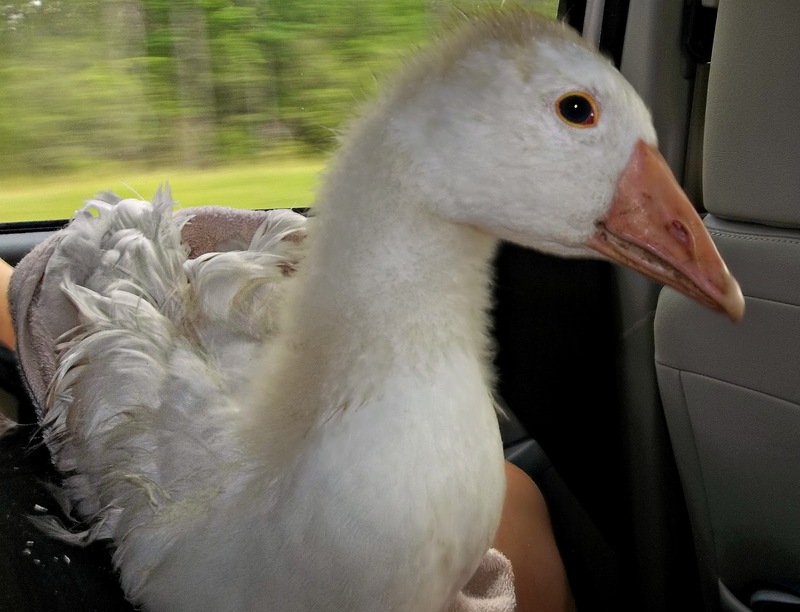 FL Auction, geese, goslings, Paxton, Sebastopols. We woke up bright and early this morning (so early that I had to wake up the dogs to take them outside – usually they’re my alarm clock) to take a very short trip to the auction in Paxton, FL. Now, we didn’t make the trip down to north Florida for the auction itself this time, instead we had another motive entirely. Ever since Blueberry hatched out and the other Sebastopol egg didn’t, my mother has had me scouring the internet in search of another Sebbie to add. I found plenty of eggs, but I honestly didn’t want to dive back into incubating Sebastopol eggs again so soon. Finally, I found an ad for goslings that wouldn’t have to be shipped to us. She called and found out that the breeder would be at the auction in Paxton early today and wouldn’t mind bringing along a male Sebastopol with him. Which was just perfect for us. Meet Henry, my mom’s new Sebbie. Henry on the ride home. Henry did quite a bit of traveling today, but surprisingly he rode calmly all the way home in my lap in the back seat. He spent the whole trip alternating between nibbling on my arm and looking out to see where we were headed. My mom may have fallen in love with Blueberry, but I’ve fallen for sweet Henry. Henry is in quarantine right now (after all, you can never be too careful). I’m sure, though, when he’s able to be around the other geese that he’ll fit right in with them. Previous post: Sebbie & Pilgrim Eggs – Hatched. Next post: Happy Mother’s Day. I do, too lol. I told my mom that she can have Blueberry, but Henry’s all mine lol.